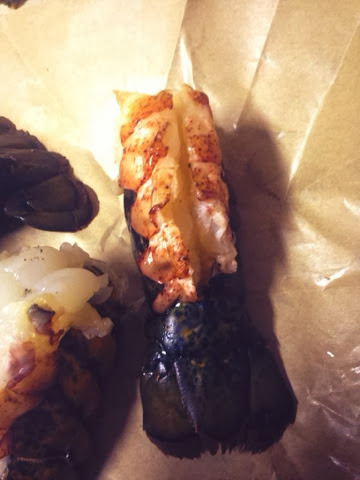 as the wine cork turns: sorry mr. lobster. so lately i have been such a martha stewart. is it martha stewart? betty crocker? same thing. if i find a recipe on pinterest, and it looks reasonable, and i can afford all the ingredients, and i know what they all are – i’m cooking it. if i think about it i’ll start posting some more of whatever i throw together in the kitchen! earlier this week lee showed up at my house with a surprise dinner for us to prepare together. since we’ve started dating, this is one of our favorite things to do together and let me tell you – the kid can cook! i was pleasantly surprised by this and it has inspired me to want to do more of it myself. 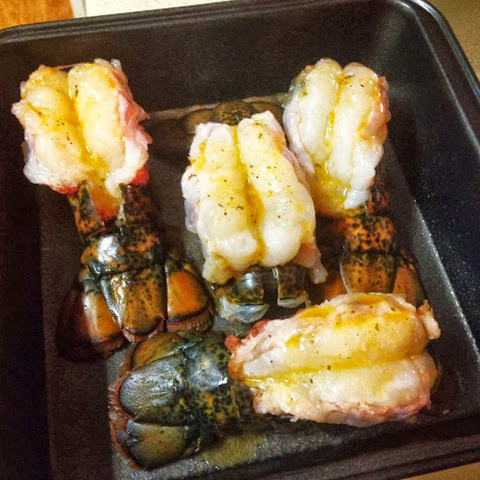 ..... and FOUR lobster tails. and then to fold back the top part of the meat so it created a nice spot to place the marinade. the marinade is composed really of whatever you want it to be. we’re huge garlic powder freaks, so after melting some (a lot) of butter, a dash of salt, pepper, and garlic powder, we spooned the liquid goodness over the top and popped them into the oven on 350 degrees (i think. i can’t remember. consult google for the right temperature if you want to make lobster. i can’t be responsible for food poisoning). to the side, i sautéed some minced garlic, and cut up the portobello mushrooms and threw them in the pan with some melted butter. we made a homemade butter cream sauce and began to boil the tortellini, which doesn’t take long at all. actually it went by so fast, i didn’t even get a picture. kidding – i totally had time, but forgot. 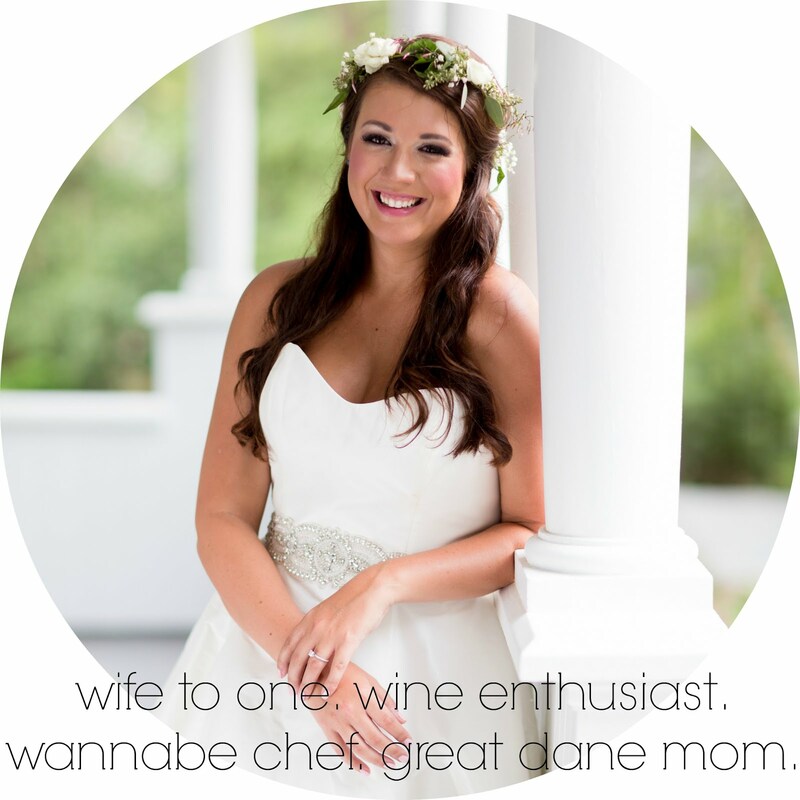 thankfully this blog isn’t solely a food blog. the lobster cooked for like 20 minutes or so until it turned completely white. another thing i thought was cool was that the outer shell turned completely red! 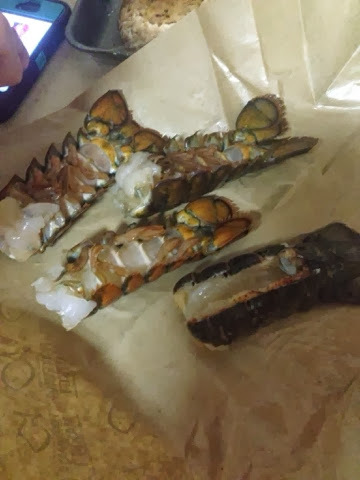 it’s this greenish-gray color going into the oven and even though it’s obvious lobsters are red, i guess i didn’t put two and two together that heat activates that? whatever. 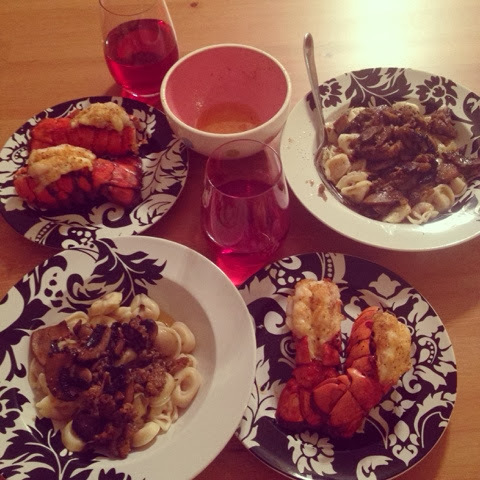 so we served the lobster tails with the tortellini covered with mushrooms for a lovely tuesday night meal. oh and we enjoyed the heck out of those bottles of wine. let’s not forget the wine. never, ever forget the wine. hope your week night meals are a yummy to the tummy as mine. get on the zucchini boat!